One of the most misunderstood topics in business is incorporation. There are so many myths and misunderstandings. I would like to take a moment and discuss what a corporation can and cannot do for you. Many beginning business owners become obsessed with details. They want to do things right from the beginning so they go out and form a corporation, or worse, an LLC. They are under the impression that this is either necessary or a good idea. For most new businesses, a sole proprietorship makes the most sense. It’s simple, cheap (or free), and is the easiest to undo if the enterprise doesn’t pan out. I think I’ve spent more time undoing corporations that should have never been formed than forming corporations that make good sense. As odd as it may seem, closing a corporation can be costlier than starting one. 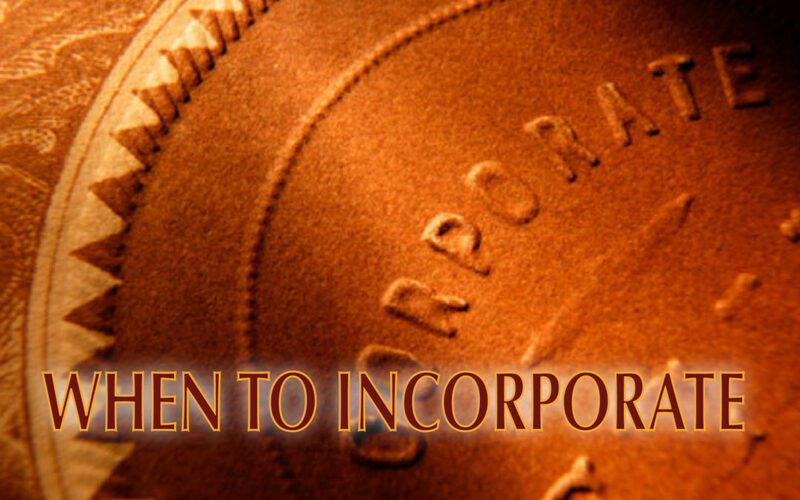 Many people think that a corporation is necessary for liability protection. I feel that this idea creates a false sense of security for many. In most circumstances, a creditor will require a person to personally guarantee any debts. As far as liability exposure, the protection it provides is limited and is almost non-existent for very small companies. The principals of small corporations will usually be named as defendants in addition to the corporation in the case of a lawsuit. Insurance should always be your first line of defense for liability protection, incorporated or not. Another misconception is that incorporating in another state saves money. It only saves money if you operate illegally. To be legal to operate an out-of-state corporation in California requires registering as a foreign corporation. Guess how much that costs? The same amount it would cost to be a normal, domestic California corporation. Plus you have to pay the other state’s fees and probably a registered agent fee as well. So why do small enterprises choose to incorporate? The two main reasons are tax savings and liability protection (in some circumstances). I’ve found that the tax savings makes incorporating sensible when the net income passes about $25,000 (depending on the specifics of the business). Others may have their own reasons for incorporating such as status and establishing corporate credit. The important thing before you decide to incorporate is that you clearly understand why it makes sense for you, what the implications are — good and bad, and what the costs are, not just to start it, but to maintain it. One last thing to cover about incorporating – the relative ease of doing so. There are many legal websites that will form a corporation for you. It’s relatively inexpensive, especially when compared to the cost of maintaining the corporation. The ease and low cost has proven to be a siren song for unwitting new business owners. They punch in their credit card number without knowing what type of corporation they should be or even why they’re doing it in the first place. If you have been incorporated before and know exactly what you’re doing and why and just need a service to file paperwork, these services are fine. If you don’t, it might be worth the extra cost of going through an attorney or a CPA (or both). You may end up doing that anyway – the second time after you discover you probably should have in the first place. I’ve presented some broad concepts here should not be used to base your decision. My objective was simply to make the reader aware of potential traps. It’s a big step and you should take advantage of the advice of both an attorney and a qualified accountant. Everybody’s situation is unique so it’s impossible to address any particular situation in an article. Which Entity Type Is Best? Sole Proprietorship – Simplest and least expensive; has one owner Partnership – Unincorporated business owned by more than one person C Corporation – Traditional corporation, pays income tax twice S Corporation – Corporation featuring flow through to shareholders and single step taxation Limited Liability Corporation (LLC) – Similar to an S corporation, but taxed differently.